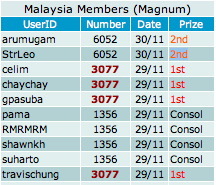 Congratulation to all Malaysia members. The SMS forecasted number that send out on 29 nov 2011 (Special draw) hit 1st prize direct. It is a privilege to be Gold membership, you will received our special selection number to your handphone. Don't miss the opportunity to be the top prize winner! Join our Gold membership now! To upgrade, call 92300837 or 02-92300837(Malaysia) to enquire how.